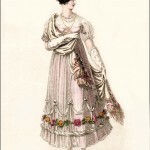 Fashions of London and Paris, May 1805. This print is especially interesting as it presents dresses worn for a very specific occasion: “Installation of the Knights of the Most Noble Order of the Garter, at Windsor, April 23, 1805.” One assumes that these dresses would have been worn by a wife or daughter or sister of one of the newly installed knights, or one of the other noble women in attendance. 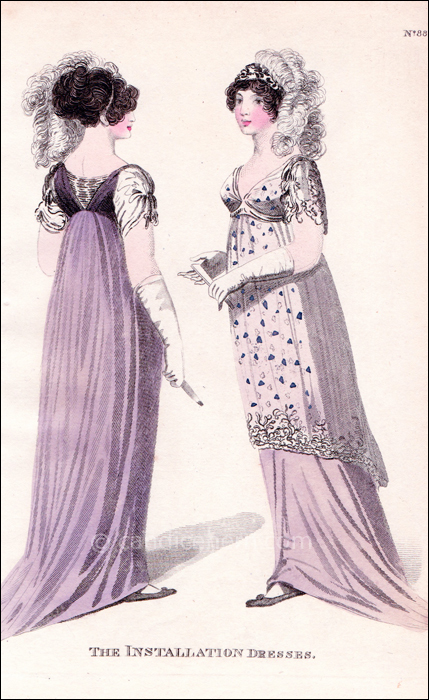 The print shows “Two Full Dresses,” one for morning and one for evening. This would have been one of the few times that full dress was worn in the morning. The Installation Ceremony took place in the late morning through the afternoon, and was described in The European Magazine as an occasion full of splendor, attended by the King and Queen, and all their Princes and Princesses. As many as 35,000 spectators were said to have watched the procession into St. George’s Chapel, where the private ceremony took place. There was a dinner followed by a ball. 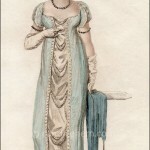 The Morning Full Dress would have been worn through dinner, but ladies would have changed into Evening Full Dress, or Ball Dress, for the rest of the evening. You can read a detailed account of the ceremony, dinner, and ball here. “Fig. 1–Morning installation dress of royal purple and silver. 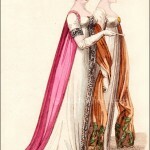 The sleeves and back of white and silver silk, the sleeves festooned and ornamented with diamonds. The hair dressed with a bandeau of diamonds and white feathers. Purple shoes and fan.